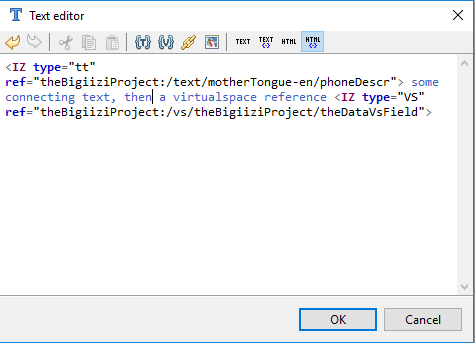 The string type used directly for text can allow the use of HTML tags, or iiziTags for a text ID, and any combination of these. The Property Editor indicates this option by displaying a ‘TEXT’ and an ‘HTML’ icon in the value field. Clicking either of these icons will open the Text Editor with support for iiziTags, text IDs, HTML tags and links.